Surfing website and reviews that also covers paddle boarding, bodyboarding, windsurfing, kiteboarding and more. 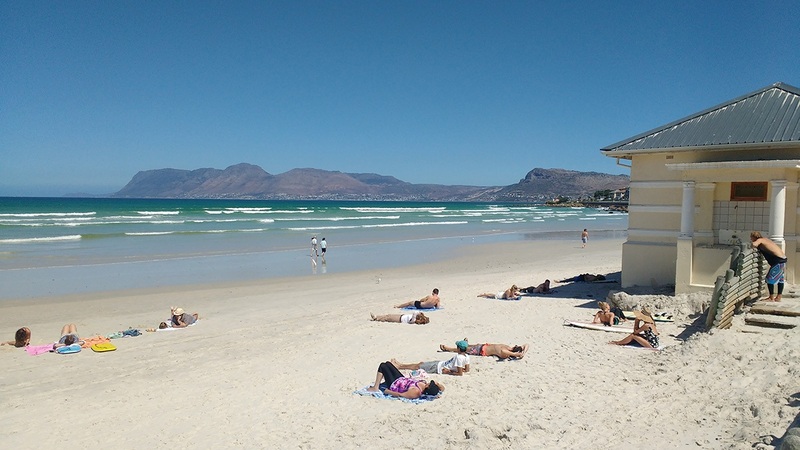 I decided to visit Muizenberg (a beach town located in the south of Cape Town) as I was looking for a chilled out week where I could surf and work online. 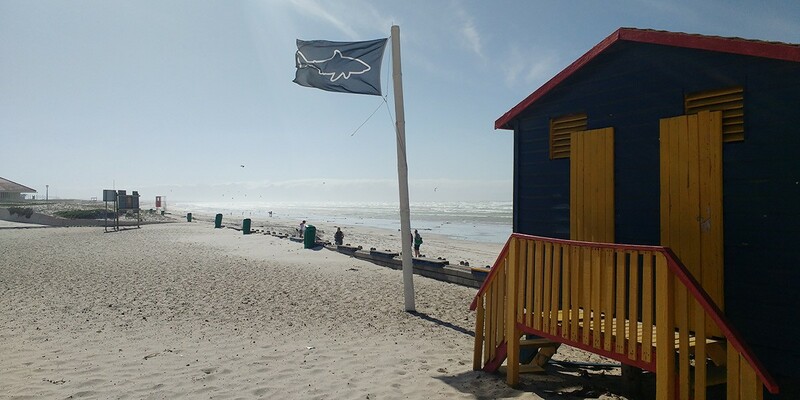 Before coming, I’d researched the best place for surfing in Cape Town and after talking to my South Africa friends, they confirmed that Muizenberg was the place to go. I expected a small seaside town with good quality and consistent waves and that’s exactly what I got. 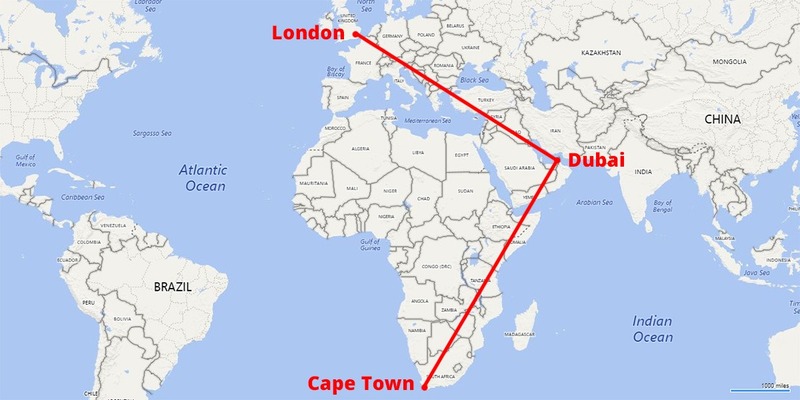 Whilst trying to find the cheapest flight from London to Cape Town the 2 cheapest options I came across were 1) Ethiopian Airlines and 2) Emirates – both of which involved a stopover in a non-direct route from London -> Dubai -> Cape Town. In the end I opted for Emirates mostly due to brand name recognition and it was only slightly more expensive. During the first part of journey I flew in on the airbus which is a massive airplane I’d never been on before. This was certainly an upgrade (especially with the onboard entertainment) after flying so many times on low budget airlines such as Easyjet and Ryanair for so long. The stopover was in Dubai for a few hours in the middle of the night and I then continued the second leg of the journey on a normal sized airplane from Dubai to Cape Town. The flight was filled with white South Africans and my first impressions of everyone was that they had a beige look about them (I guess from all the sunlight), compared with the normal pale look I’m used to. Looking out of the plane as I arrived in Cape Town I noticed that the whole landscape was grey, which I later found out was because there was a drought going on. It was also quite a contrast flying in past skyscrapers and giant homes and then to see the reduction in house sizes until you’re right next to the airport where you have people literally living in tin sheds. I went in March and booked the flight a few months ahead of time and it cost me £550. If I were to do head back to South Africa again then I’d probably pay extra for a direct flight because doing a full day’s worth of flying really knackered me out. 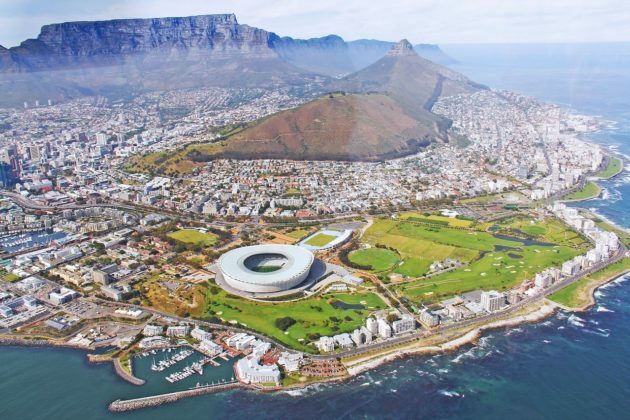 After arriving at Cape Town International Airport, the first thing I did was to get a sim card with data so I could use the internet on my phone and get an Uber. I’d recommend getting a South African sim card (even if you’re not going to use Uber) as having the internet on a phone just makes your trip so much more convenient. There was a Vodacom phone booth that I signed up to which was just on the right after getting through customs. The price was 204 rand which gave me 1 Gigabyte of data, although I could have got this cheaper if I’d bought it online ahead of time. Whilst it wasn’t a great deal if you’re used to free internet, compared with other offers in South Africa it didn’t seem too bad. After getting my phone set up I went and checked the airport taxi booths to see their prices. To get in a coach minibus taxi with a bunch of other people cost the same price as getting an Uber. So I simply loaded up Uber, set a destination for Muizenberg from the airport and then went to the pick up point. You have to leave the main entrance and head down to a side gate to find this pick up point. The cost of the Uber from the airport was 285 rand. The journey took about 50 minutes and I had a nice chat with a Zulu taxi driver on the way who recommended a bunch of hikes in the surrounding mountains. However, when I checked my bill later on I noticed that my bank had given me an extra charge because it was a transaction in a different currency. To overcome this problem, I changed my settings within Uber so that I could pay in cash and then for the rest of the trip I didn’t get these additional charges. Before arriving, I’d searched online for a few private rentals but couldn’t find anything that provided good value for money. I’d also looked at staying in a few of the surfing hostels which looked like a viable and much more social option. In fact, I would have chosen one of these places if I had wanted a more social experience, but I was wanting to do some work as well as surf so I decided against this. Plus I got so much more by finding a good place on Airbnb. With a backpackers surfing hostel I would have got a beach window room which is nice. 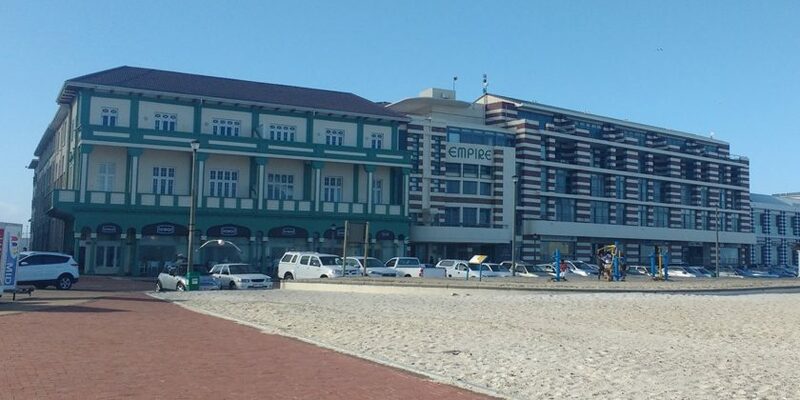 However, on Airbnb I found a place in the Empire Building that was directly on the beach front plus it came with 2 bedrooms, a kitchen, lounge, 2 bathrooms and a balcony. A week after I’d left I noticed the accommodation price had gone up so perhaps I got a good deal. However, there was still plenty of other good deals to be found so I’d recommend checking Airbnb as your first place when looking. I ended up paying for £275 for 7 nights. The only one complaint about where I stayed was that the internet wasn’t that good. The host gave me 1 gigabyte of data which allowed me to access the public wifi within the apartment. This wasn’t really enough for the work I was doing so I rationed it by not doing data heavy things such as looking at YouTube or image heavy sites – but I still managed to burn through the data and had to buy a top up. However, keep in mind that I was using the internet for work so casual users that avoided online videos and data heavy sites would probably be fine. 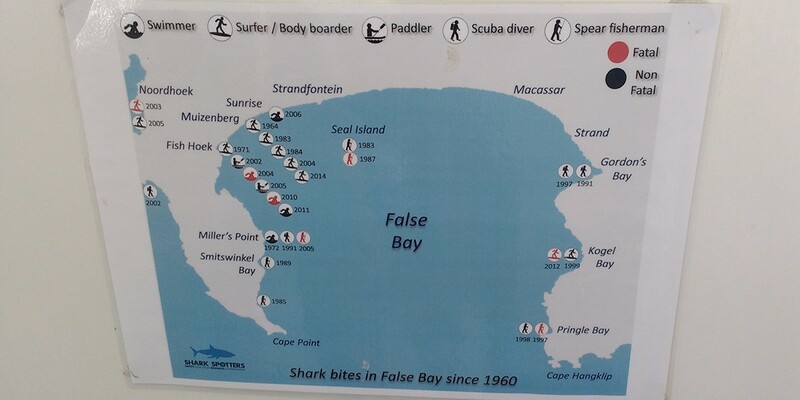 Most of these places are also surf schools and offer surfing lessons as well if you need them. There’s also paddleboards to rent as well. 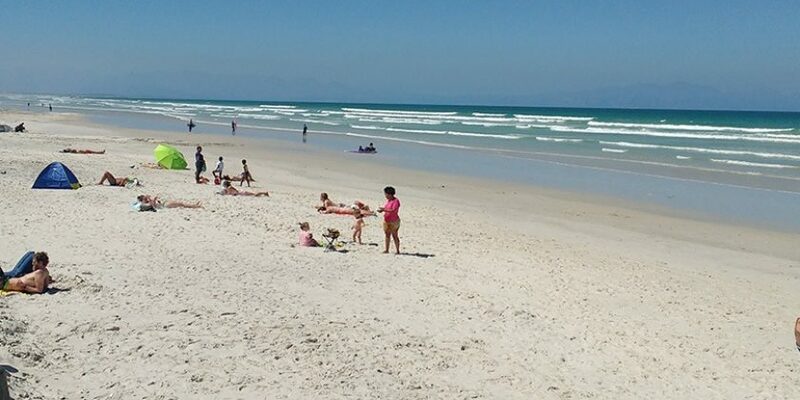 Muizenberg beach itself has good quality sand and everyone was surfing directly in front of the beach front. There’s a bunch of weird looking tubular seaweed that you’ll see scattered along the beach and occasionally I saw jellyfish but was never stung by any of them. 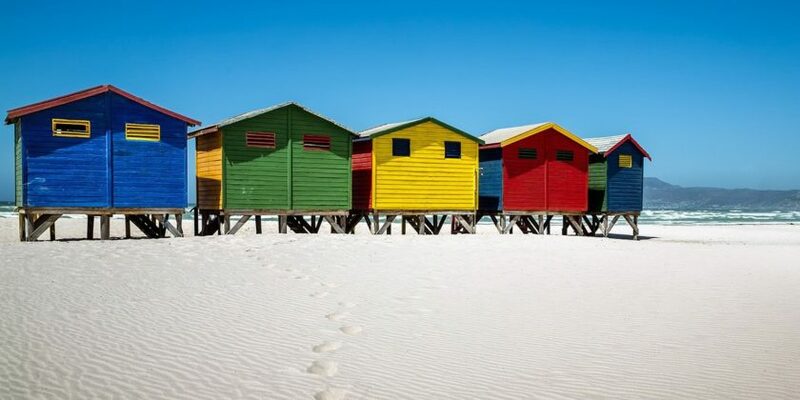 One of the main things you’ll notice is the colorful Victorian beach huts. 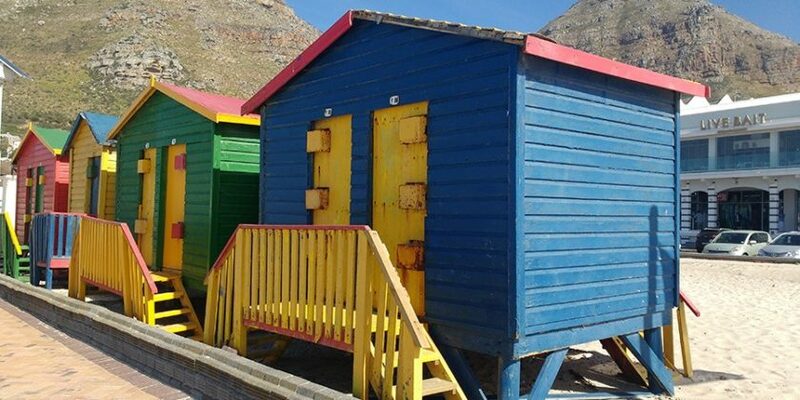 These are iconic to Muizenberg so it was surprising to find that they were in fairly bad disrepair and most of them were closed. I managed to peek inside of a few that were open and I found to be pretty grotty. I feel like this is really a missed opportunity here, if they were renovated and had a small kitchen installed then I could really see them getting some use. Plus people would be willing to pay for this and they’d be a small money maker for whoever owned them. Huts like this are worth a small fortune UK seaside towns. 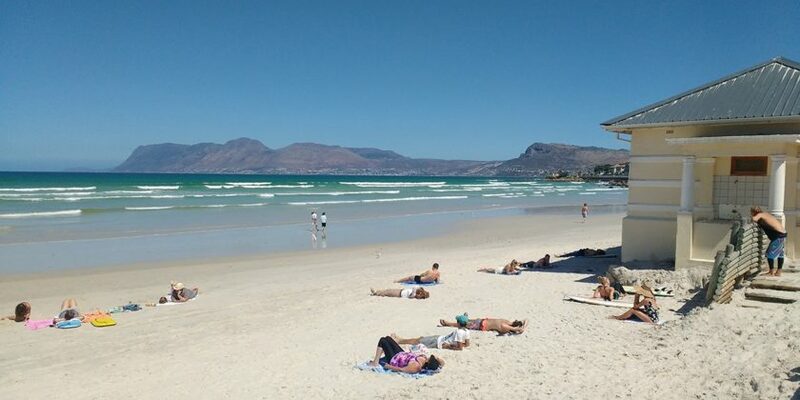 Even if you’re into surfing, Muizenberg beach is great to sunbath on. It’s clean, has good quality white sand, there’s a public toilets and a bunch of restaurants and cafe’s along the beach front that you can eat in. 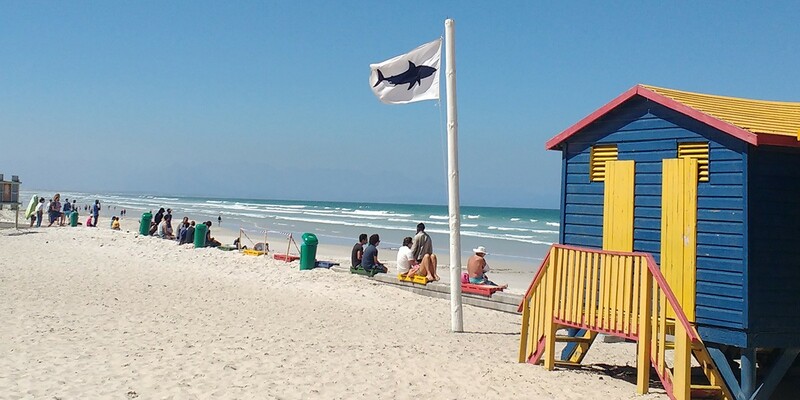 There’s even a water slides further along the beach which you can go to and the shark spotters (which I’ll get to in a bit)..
Part of the reason why Muizenberg is so popular for surfers is just because the waves are so consistent. I was there for a full week and even on the day when things were smallest, there was still surfable waves to be found. Most of the week, I was seeing waves that were 3 to 5 foot and there were no major undercurrents so the paddle out wasn’t too difficult. 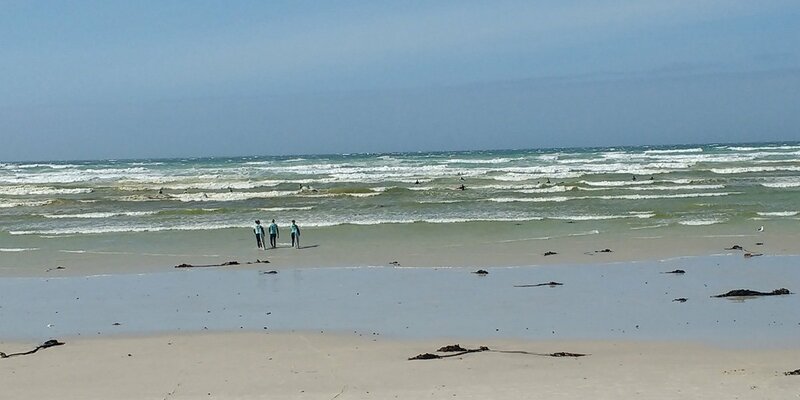 The water temperature is also warmish because the water here is from the Indian Ocean, whereas if you try surfing further north on the western side of Cape Town you get the Atlantic Ocean which is much colder. Overall, Muizenberg is a great spot if you’re a beginner or improver surfer, however if you’re an intermediate or advanced surfer then you might want to look for spots with bigger barrels (or wait until the conditions are right in Muizenberg). As well as seeing surfers and paddle boarders, on one or two of the windy days there were a number of kite surfers in action as well. In fact, it was so windy on one of the days that the Cape Town Cycle Tour got cancelled. I was on the beach, checking out the waves and just about to hire a board to go surfing when I noticed something. No one was in the water. Then a siren went off and so I asked someone what was going on. Apparently, a shark had been spotted and that’s when the siren alarms so everyone gets out the water. 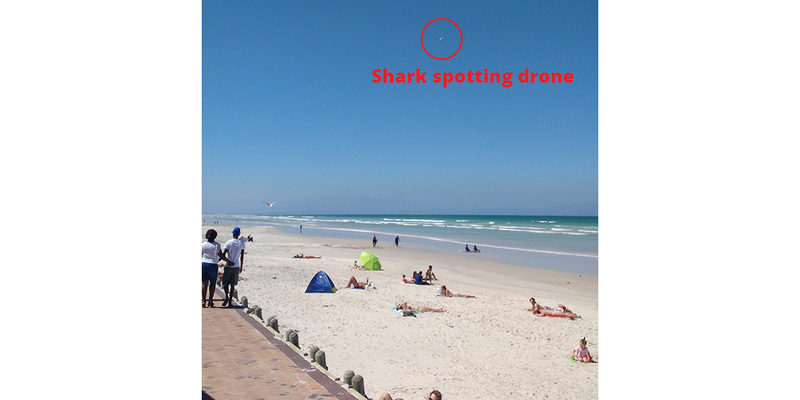 I then saw a small flying drone going across the beach and along the waterfront trying to spot the shark. 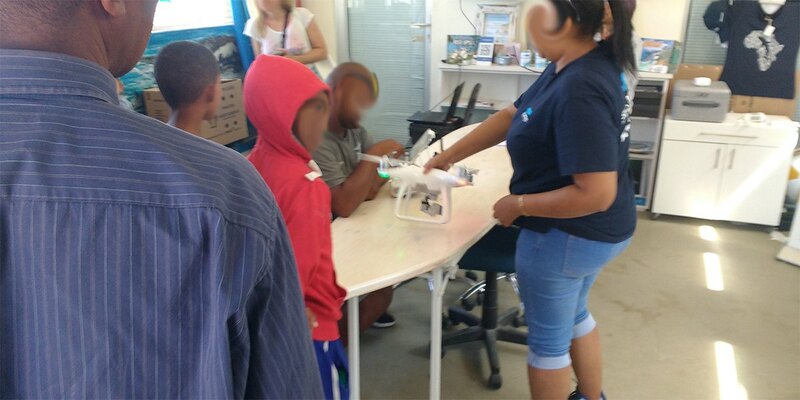 Afterwards, you could even go inside the shark spotters hut and see them checking an ipad to see what the drone had found. About an hour and a half later apparently the shark had passed and people were starting to return to the water. 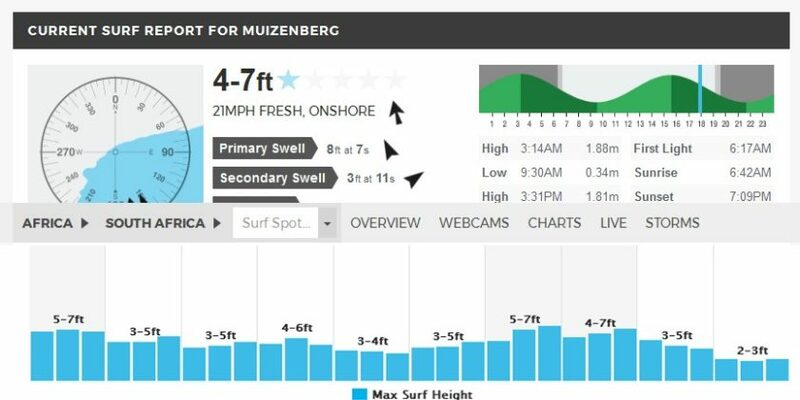 I decided to skip surfing that day. 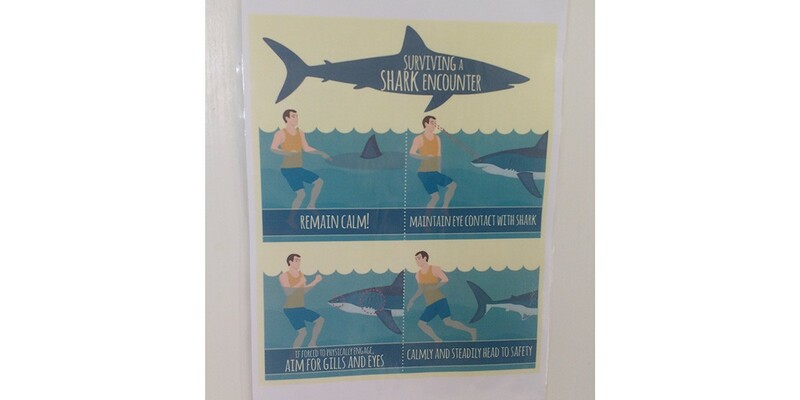 However, keep in mind that you’re highly unlikely to get attacked by a shark. 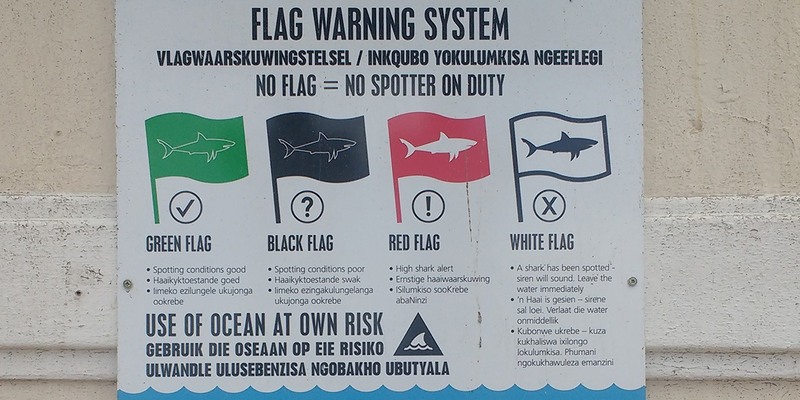 The fact that there are shark spotters actively working means that you’re safer (that shark could have just swam by and no one would have know without the spotters). Other unfortunate event’s such as car accidents are much more likely to occur but no one panic’s about those (or at least not many people do). Aside from the surfing there are a few other things to see and do in Muizenberg. I highly recommend the free walking tour that runs at 10am everyday from the Surfer’s Corner just on the beach front. Doing this tour on your first day will allow you to get your bearings and show you places that you might want to check out later on in the week. Details about the tour can be found on their website here. Learning how the Surfer’s corner/surfer’s circle on the beach front was being redeveloped to include a statue of Heather Price, a woman that originally pioneered surfing in Muizenberg. Apparently, it’s development had been delayed as they’re had to change the statue to make it more abstract and to not be that of a white woman since there’s still so much racial tension in South Africa. Also, apparently Agatha Christie used to come down here to surf as well. A visit into Cecil Rhodes Cottage. This place was quite a humble residence for someone that was so powerful and wealthy. He was a very controversial and ambitious figure and I felt like the tour guide treated in a well balanced way – explaining both the good and bad that he achieved. Finding out about the Battle of Muizenberg, though we didn’t go inside it as it’s a homeless persons camp nowadays. It’s where the original Dutch settler’s fought the British and where the insult of ‘rock spider’ comes from since the Dutch would hide amongst the rocks to take cover from the British fire. Other places along the tour include the SAPS Museum, a police station museum which includes some gruesome historical cases and is free to enter so it’s worth a visit. Plus it also has nice garden in the back for relaxing with good views overlooking the beach. There’s also the fancy Casa Labia historical house owned by a famous wealthy family in South Africa and the Yokohama Japanese house made papier mache that is apparently slowly deteriorating. Apparently, commercial fishing is banned in the bay but some of the local families have a traditional right to fish. 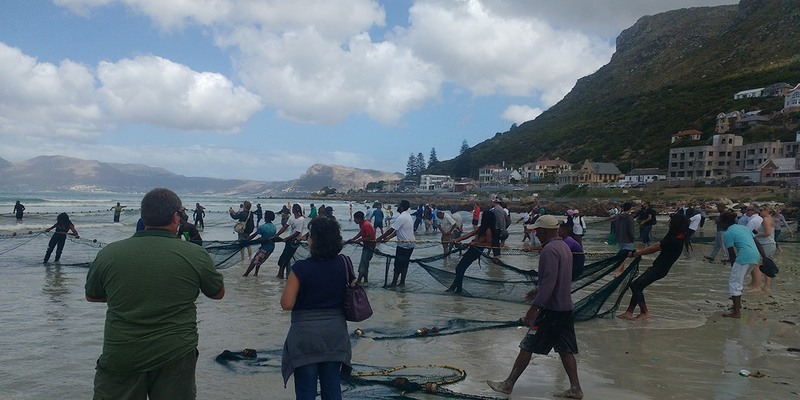 I’m not sure how frequently this happens but I was lucky enough to see a small local community of people pulling in nets filled with yellowfin tuna. When I arrived, there were 2 groups of people tugging on 2 line ropes that were on each end of a large net. 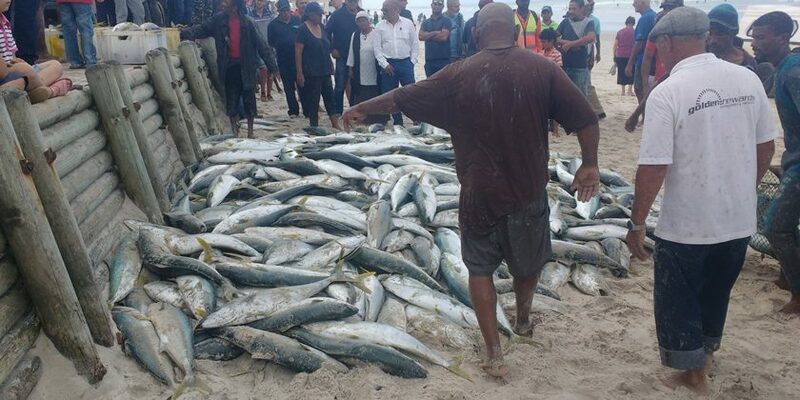 As they got closer to the shore everyone started picking up the tuna and jumping on them to make sure they didn’t get away plus there was loads of shouting and fish flying everywhere. 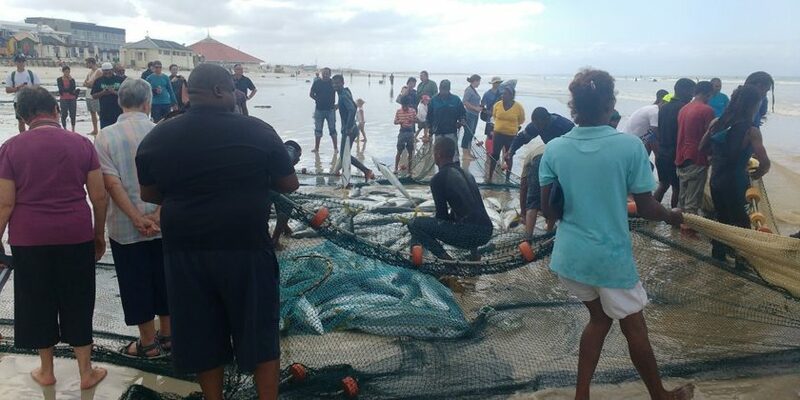 The dead fish were then dragged up the beach with a number of them being being placed into a van and another bunch being divided amongst the locals or auctioned off. There was even a couple of arguments as people tried to walk out with a fish when no one was looking. It was a great scene to watch and later on I even managed to eat some yellowfin in one of the local restaurants. A number of other things that also may be of interest whilst there include: cycling, yoga and hiking in the surrounding mountains (though if you do this I’d recommend going up there with a tour guide). The Surf Emporium – for their daily Bom Dia deal, which offers a good deal on a coffee and toasted sandwich. The Knead Bakery – for a coffee, croissant and free wifi. Easy Tiger Burger Bar – for a variety of burgers. Live Bait – for a upper end fish restaurant. The Oven Baked Pizzeria – just off the Main Road near the train tracks. If you’re looking for food supplies then there’s a Checkers supermarket on Atlantic Road, just behind the beach front. It was the only place I could find that supplied Biltong which goes well with watermelon. Surprisingly, I didn’t find the price of self catering that much cheaper compared with eating out. Maybe this is to do with the cost of manual labour being cheaper in South Africa? 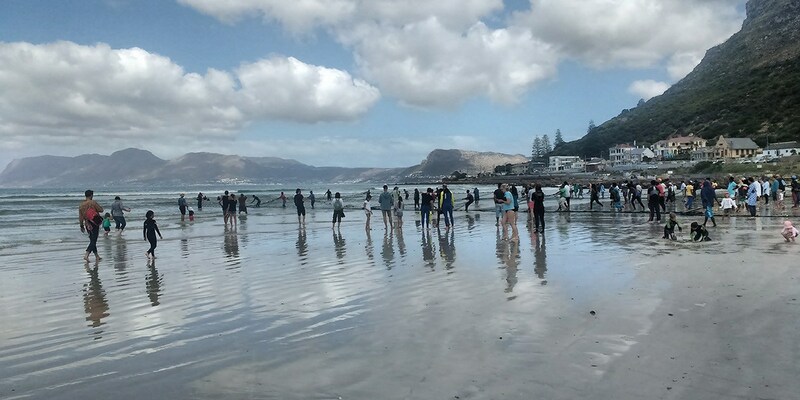 To be honest with you, I didn’t get out of Muizenberg much during my stay, however I did spend a morning walking down to St. James which is just nearby. I didn’t spend too long in St. James but aside from more beach huts I didn’t find too much going on. If you were to venture out then you can use the train to head further west along the cost, however I was told not to use this train at night. Uber was very helpful for my trip but even if you don’t sign up for data on your phone you still might want to consider this little trick. Phones can still use their GPS even if they don’t have an internet connection. This means you can download apps such as Maps.me or local maps using Google maps. You can then use these maps even when you’re offline to find out where you are with your GPS. Just be subtle about it and don’t go around flashing your fancy phone. 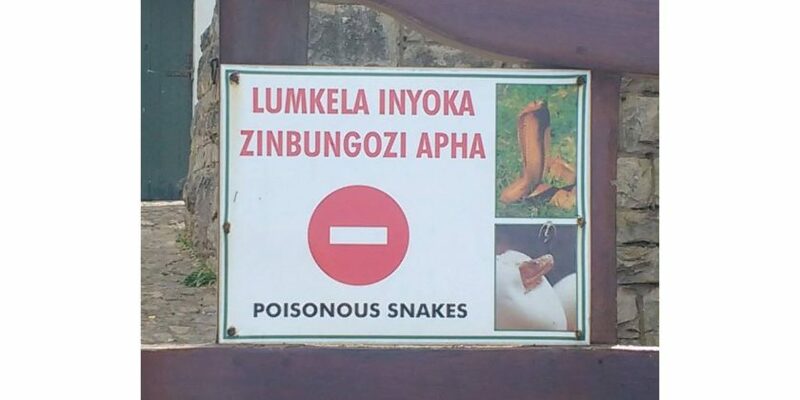 I thought I’d cover this aspect, since a lot of people always think of danger when they hear South Africa. 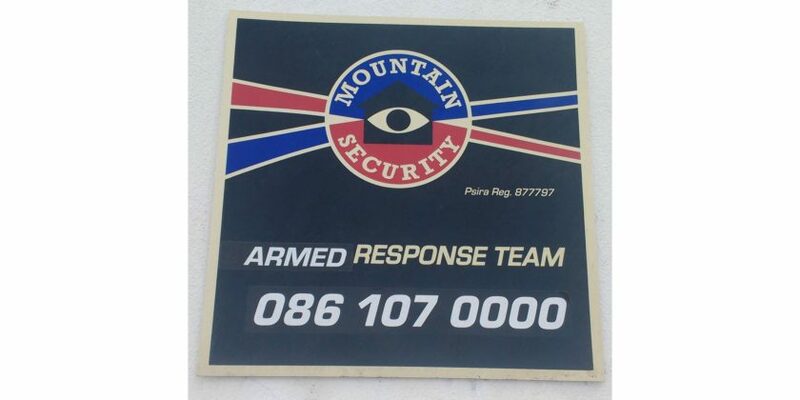 When I was staying in Muizenberg I actually felt very safe. They have security guards patrolling the beach front even at night time (which was on my door step) and during the day time I wandered around the town and never felt in danger. However, there is a massive amount of inequality (which is based on racial lines leftover from apartheid) and so there’s a number of homeless people in the town. 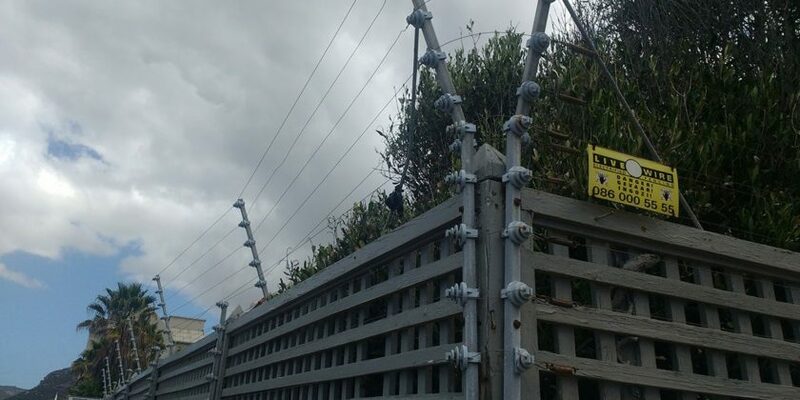 It’s quite strange seeing security guards in the car parks of supermarkets, having houses with placards declaring their have armed response security teams and also electricity fences installed along the perimeters of many houses. 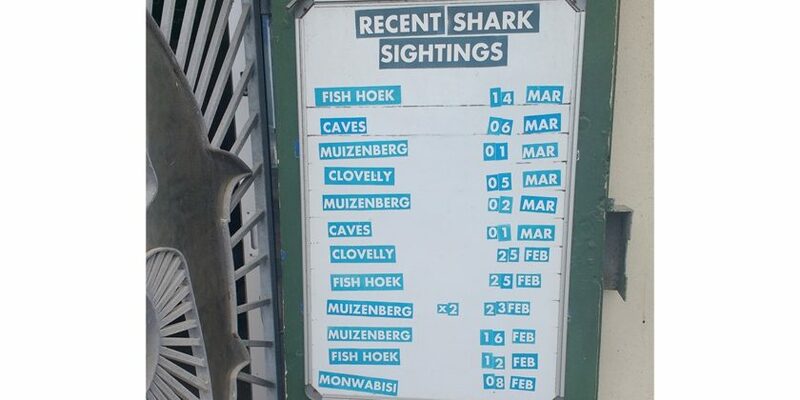 There was even a house which had a poster saying it owned pet snakes – which was told was done because snakes are seen as the devil in some South African cultures – so it keeps away thieves. Having said all of this, you’re unlikely to encounter any problems – just be sensible. Don’t do anything stupid like wander down a dark alley at 2am. If you do go out at night, take a car or taxi and don’t go on any long night time walks, plus avoid the train at night. Also, if you want peace of mind then you can always just get yourself some comprehensive travel insurance and often plans will also cover you for surfing as well. 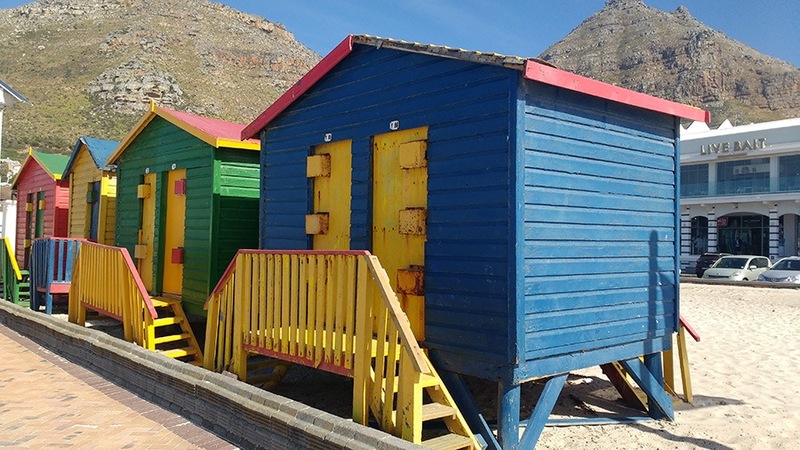 Muizenberg is a great little seaside town and I really enjoyed my trip. It’s perfect for anyone that’s learning to surf, paddleboard or kite surf because the waves are very forgiving. It’s also great for people that like to relax by the sea or do a weekend getaway. I stayed there for a full week during which I spent my time working, looking around and surfing – so this was perfect for me before I headed off elsewhere. However, if you’re not a surfer and don’t like chilling out by the beach, a night or two would be more than enough. Whilst I was there I didn’t see much of a nightlife party scene so I’d head elsewhere for that, but there are number of good bars and restaurants. Also, more advanced surfer’s looking for large waves might want to look elsewhere (unless the conditions are right). 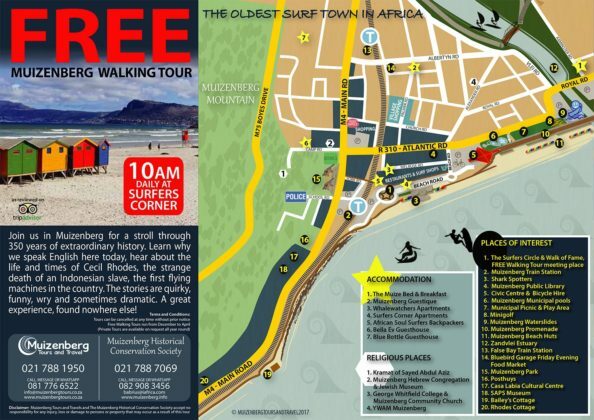 Overall, I highly recommend it and I’d encourage you to check out Muizenberg if you get the chance. If you’re going on a surfing vacation and you’re travelling with your own board then you might want to check out our guide to surfboard bags. Earnings Disclaimer: If you buy a product from some of the websites we link to, LimitStretch.com may receive a commission. As an Amazon Associate LimitStretch.com earns from qualifying purchases. LimitStretch.com is a participant in the Amazon Services LLC Associates Program, an affiliate advertising program designed to provide a means for us to earn fees by linking to Amazon.com and affiliated sites. As an Amazon Associate LimitStretch.com earns from qualifying purchases. LimitStretch.com is a participant in the Amazon Services LLC Associates Program, an affiliate advertising program designed to provide a means for us to earn fees by linking to Amazon.com and affiliated sites. Amazon and the Amazon logo are trademarks of Amazon.com, Inc. or its affiliates. LimitStretch.com is also a part of other affiliate programs, so if a product is bought on website we link to, then we might receive a commission.